From shedding light on the waste that travels through Toronto’s waterways to rethinking opioid overdose kits to help save more lives – here are some of the ways U of T students are making their mark in the city. Rachel Giles spent a hot summer’s day sorting through smelly piles of garbage and debris at the mouth of the Don River. This winter, she’ll be wading through ice cold water in heavy-duty gear. These might be unusual research settings for most, but Giles – a master’s student in ecology and evolutionary biology – wouldn’t have it any other way. Giles is part of Chelsea Rochman’s lab. Rochman, Giles and a group of students spent that hot summer’s day collecting trash to find out how much of it comes down the Don River and enters Lake Ontario. “These plastic materials that are not caught would go down into the lake and break down into smaller and smaller pieces and become microplastics,” said Rochman, an assistant professor of ecology and evolutionary biology. “Little bits of plastic enter into our entire aquatic food chain, and from my research we find they can have impacts on the wildlife that live there." Rochman’s lab focuses on the sources and impact of contaminants like plastic that end up in waterways – including those found in urban areas. The research group, also known as the U of T Trash Team, participates in regular urban shoreline cleanups and outreach programs at schools. Giles’s sub-zero research this winter will focus on road runoff and its effects on invertebrate species in the Humber River that live in the sediment. She’ll be looking at the kinds of contaminants that make their way into waterways including plastic and road salt. Two U of T Scarborough students spent the first half of the year getting to know the inner workings of Toronto’s city government. Yasmin Rajabi and Hazelmae Valenzuela participated in the City of Toronto Protégé Program, a mentorship initiative that paired them with female councillors and staff who they shadowed while participating in constituency work and attending city council meetings. “In municipal politics you actually see more immediate change happen, and because it’s local it has a much larger impact on the people around you,” said Rajabi, who was mentored by Councillor Mary-Margaret McMahon, and Mary-Anne Bedard, director of service system planning and integrity. 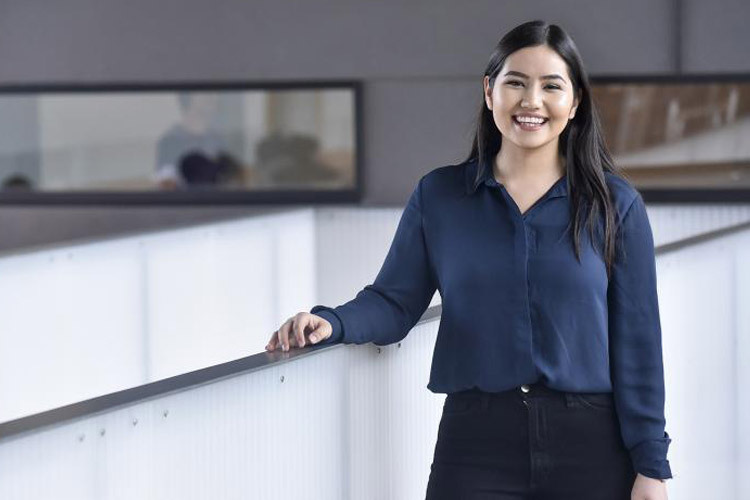 Rajabi, who has since graduated with a double major in public policy and city studies, is now working at Toronto think tank Brookfield Institute for Innovation and Entrepreneurship. She said the Protégé Program was invaluable preparation for her current role, where she regularly works with the public sector on designing programs and policies. Rajabi said she encourages students to apply for the Protégé Program, regardless of their academic program. 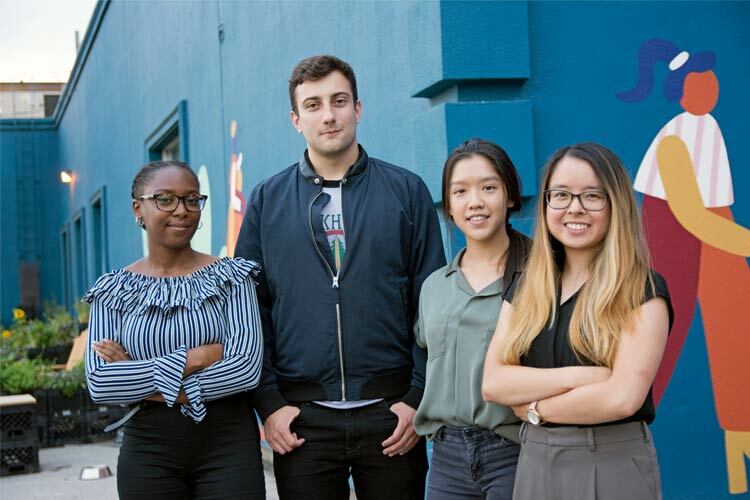 Earlier this year, first-year students in the Faculty of Applied Science & Engineering went out into the city to help businesses, social services, governments and other community organizations address challenges with design solutions. 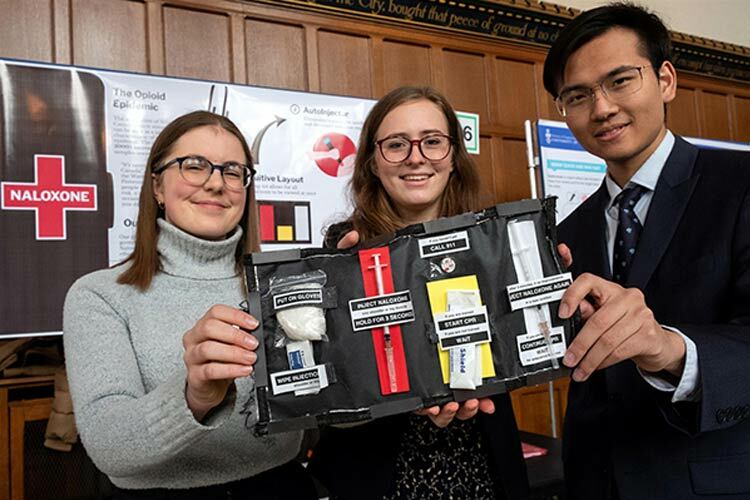 The students, who were taking the engineering Praxis course, tackled a range of projects from redesigning the life-saving naloxone opioid overdose kits to helping a sporting venue develop a device that would assist participants in a quick knife-draw competition. Cassandra Chanen, Jacqueline Fleisig and Zhengbang Zhou worked together on the naloxone kit design. They talked to front-line workers and business owners about how they use the naloxone kits with the aim of improving its design to speed up the time it takes to deliver the drug. Alan Chong, an associate professor, teaching stream, who taught the course, said this kind of community partnership is a unique opportunity for students. “The most important experience for them is being able to understand that you're not doing engineering in a vacuum, you're really dealing with a whole group of stakeholders and you're dealing with complex problems that you may not be able to see all the solutions to." A new cohort of engineering students will have the chance to work on community design projects when the course begins again in January. Twelve post-secondary students, including four from U of T, spent their summer travelling to cities around the world to learn about what makes for good city building. They were participating in a fellowship program organized by Sidewalk Toronto – a partnership between Waterfront Toronto, a government-led initiative to develop Toronto’s waterfront, and Sidewalk Labs, the subsidiary of Alphabet (which also owns Google) that seeks to use technology to improve urban living. The students’ urban globetrotting culminated in a report on how they would envision Sidewalk Toronto’s proposed Quayside neighbourhood. “In the context of our city’s widening socio-economic disparities and political divisions, I believe it is crucial to ensure that Quayside will be a model for equitable and inclusive mixed-use and mixed-income neighbourhood development,” said Sidewalk Fellow Keisha St. Louis-McBurnie, an urban studies and political science student in the Faculty of Arts & Science. The report is now published and includes 27 recommendations for how to build an inclusive, sustainable and livable urban neighbourhood. 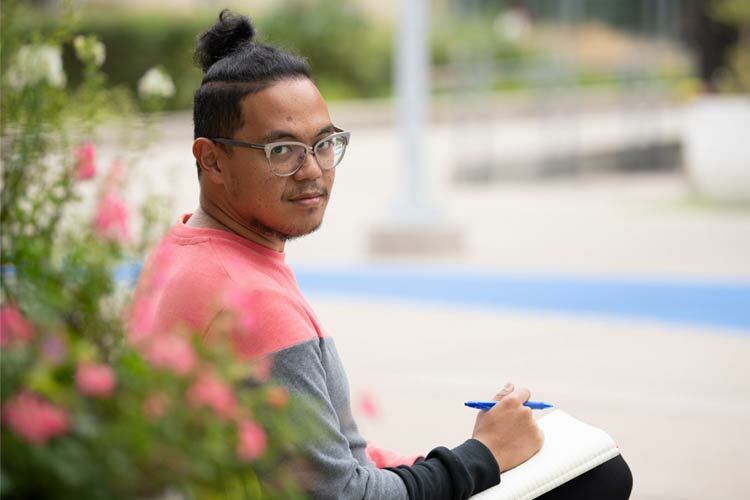 In Adrian De Leon’s book of poetry called Rouge, the “city becomes the poem.” The U of T Scarborough alumnus and current PhD student in the department of history travelled to every subway stop on the TTC, crafting a “poetic moment” for each station. While De Leon's poems tell the story of distinct parts of the city, Scarborough is where his most powerful prose takes place. The book, which was released in October, centres around two poems, both called “Rouge,” which are a response to the Danzig Steet mass shooting in Scarborough. In July of 2012, rival gang members opened fire at a crowd of 200 during a community street party, killing two people and injuring 23. De Leon was living a block away when it happened. More Canadians are choosing to commute on two wheels, and Léa Ravensbergen is hoping that number continues to rise. 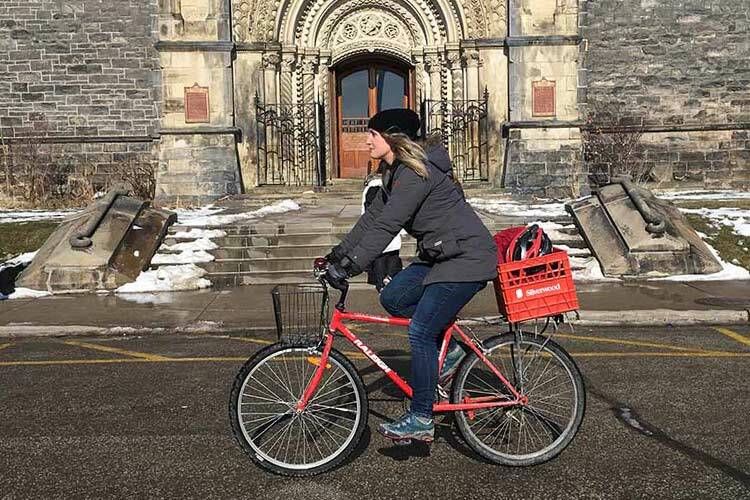 The U of T Mississauga PhD candidate has spent the last five years researching urban cycling – particularly in relation to gender – under the supervision of Professor Ron Buliung. Ravensbergen worked in collaboration with a community initiative called Bike Host, which helps newcomers get acquainted with urban cycling by pairing them with cyclist-mentors and lending them bikes and safety gear. Ravensbergen is currently gearing up for winter cycling after spending some time in Melbourne, Australia, where she was analyzing interview data and presenting her findings at Monash University.